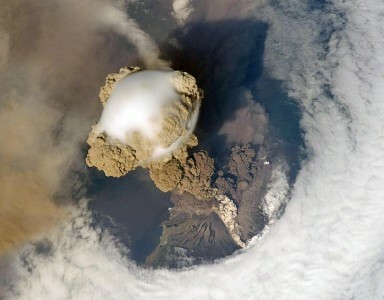 Sarychev Volcano erupted on June 12th, 2009 and was captured by the orbiting International Space Station and a few high-resolution images and a video were made available by NASA for you to be awed at. Prior to June 12, the last explosive eruption had occurred in 1989 with eruptions in 1986, 1976, 1954 and 1946 also producing lava flows. Commercial airline flights were diverted from the region to minimize the danger of engine failures from ash intake. This detailed photograph is exciting to volcanologists because it captures several phenomena that occur during the earliest stages of an explosive volcanic eruption. The main column is one of a series of plumes that rose above Matua Island (48.1 degrees north latitude and 153.2 degrees east longitude) on June 12. The plume appears to be a combination of brown ash and white steam. The vigorously rising plume gives the steam a bubble-like appearance; the surrounding atmosphere has been shoved up by the shock wave of the eruption. 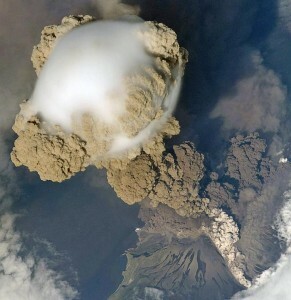 The smooth white cloud on top may be water condensation that resulted from rapid rising and cooling of the air mass above the ash column, and is probably a transient feature (the eruption plume is starting to punch through). The structure also indicates that little to no shearing winds were present at the time to disrupt the plume. By contrast, a cloud of denser, gray ash — most probably a pyroclastic flow — appears to be hugging the ground, descending from the volcano summit. The rising eruption plume casts a shadow to the northwest of the island (bottom center). Brown ash at a lower altitude of the atmosphere spreads out above the ground at upper right. 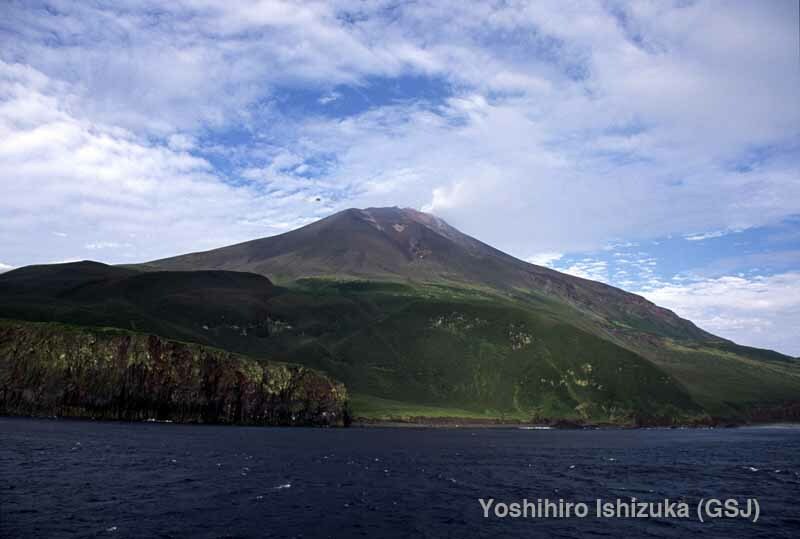 Low-level stratus clouds approach Matua Island from the east, wrapping around the lower slopes of the volcano. Only about 1.5 kilometers of the coastline of Matua Island (upper center) can be seen beneath the clouds and ash.